Space-time diagrams, in my words, contain all of the physics of relativity. Remember the math for time dilation? Space-time diagrams are a way to visually represent all of this information, without the mathematics. One could derive the math from the diagram, if they wished. They are a way for us to discuss this concept of simultaneity (or lack thereof) in events. In the above diagram, the blue line represents an object that is at rest. The red line shows an object in motion. Not all diagrams will look this way, though. It is common practice to multiply the time axis by the speed of light. So it becomes the “ct” axis. This convention is used in order to simplify discussions of things travelling close to light speed. The speed of light on these diagrams is generally a line, set 45 degrees between the ct and x axes. Just imagine a line with a slope of one dividing the 90 degree angle between these two. The prime (or the ‘ that follows certain variables) denotes a different reference frame. For example, if you see a bird flying past you, it is standard practice to denote it’s reference frame with these primes. Time for the bird would be t’, and distance x’. There is no real physical significance in this choice, as long as you can keep the reference frames straight in your head. Let’s construct a space-time diagram, shall we? Please note, the diagrams on this page will only consider one spatial direction (rather than making a 4D image). We see the ct and x axes, along with a yellow line. For instructional purposes the yellow line will represent the speed of light. It is not always visualized in diagrams, but I find it helpful to have on hand. Simultaneity is the idea that two events can occur at the same time. We will see that this is dependent on the reference frame. Simultaneity is important in the discussion of space-time diagrams. Now, A and A’ want to synchronize their clocks, for science or burglary purposes, we don’t judge them. How would they go about doing this? Please forgive if the light pulses are not at perfect 45 degree angles. The light pulse is sent by A, received by A’, and then A’ transmits a light pulse back to A. How does A know when to synchronize the clock? By measuring the amount of time (denoted on the axis), and then dividing by 2, A will know when to synchronize with A’. The orange line denotes when A synchronizes it’s clock. The point that the orange line touches on A and A’ is where the two agree on simultaneity. Perfect! The two can synchronize their watches for science, or more nefarious activities. Now, let’s consider two observers B and B’, doing the same thing. Maybe they are robbing the same bank, or trying the same experiment. Since neither are in motion, it looks the exact same as A and A’. But something I did not tell you, B and B’ are already in the getaway car, making their way to the bank/laboratory (again, we don’t judge). A and A’ have a secret weapon: they can look into the car and see when B and B’ are going to synchronize their watches. What do they see? Please forgive if line B and B’ are not perfectly parallel. A and A’, being in the same reference frame, will see the same thing. But B and B’, separated by a constant distance, are represented as angled lines in the diagram. Now, B and B’ are getting close to their objective, and must synchronize! Light pulses at 45 degrees, to the best of my ability. As before, B must divide the line to get the synchronization point. Maybe A and A’ have their heads together better than B and B’. Maybe they can complete the experiment/robbery first! What our scientists/robbers do not realize is that simultaneity is reference frame dependent. What looks simultaneous for A and A’ is not simultaneous for B and B’. Time is flowing differently! Now let’s draw a more complete space-time diagram for our nefarious scientist friends. 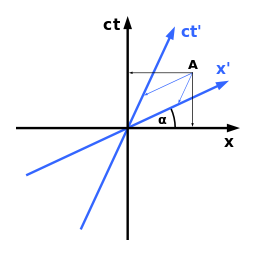 The ct and x axes of faster objects fold closer and closer to c. For objects with mass, of course, both lines attaining a slope of 1 (indicative of a 45 degree line) is impossible. Hopefully this clarifies the concept of simultaneity. Space-time diagrams do an excellent job of visually representing this phenomenon. Of course, there are more mathematics involved, and I will post a link to that. ALL OF THIS LEADS TO A QUITE DIFFERENT LABEL FOR SPACE-TIME, CHECK OUT “MINKOWSKI SPACE” AHEAD!